Made from Food — MegaFood! When Mega Food started in 1973, they wanted to keep it simple — to “produce superior whole food supplements for those who care about their health and well being” (from the Mega Food website). They found a wonderful little red house in Derry, New Hampshire, and went to work. 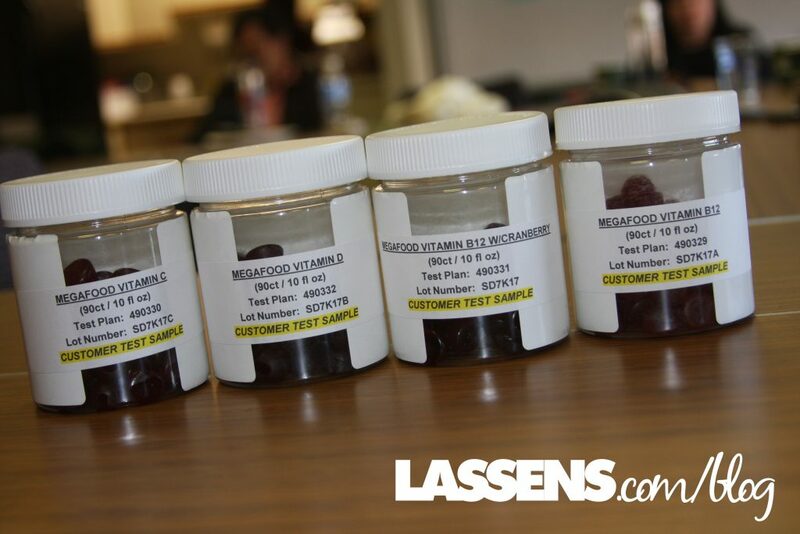 When we visited the Mega Food headquarters with several of our Supplement Managers, they had recently moved from the red house into a new state-of-the art facility with testing labs and impressive procedures. 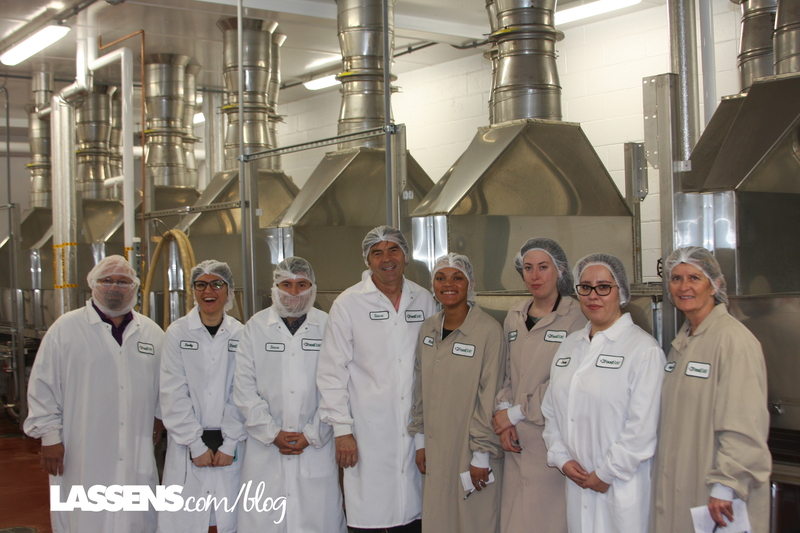 Here’s the Lassen’s crew with at the Mega Food plant! And they really mean it. I have toured a lot of facilities, and the vast majority of the time I have to leave my camera in the car. But not with Mega Food. They wanted me to take pictures of all of the processing and testing. He’s showing us the machine that crushes and blends the foods before they are dried. Mega Food’s focus has always been “Food First,” and so they find the foods that best deliver vitamins and minerals. Mega Food is really proud of their farmers, and they include them on their website. Click here to see their farmers! 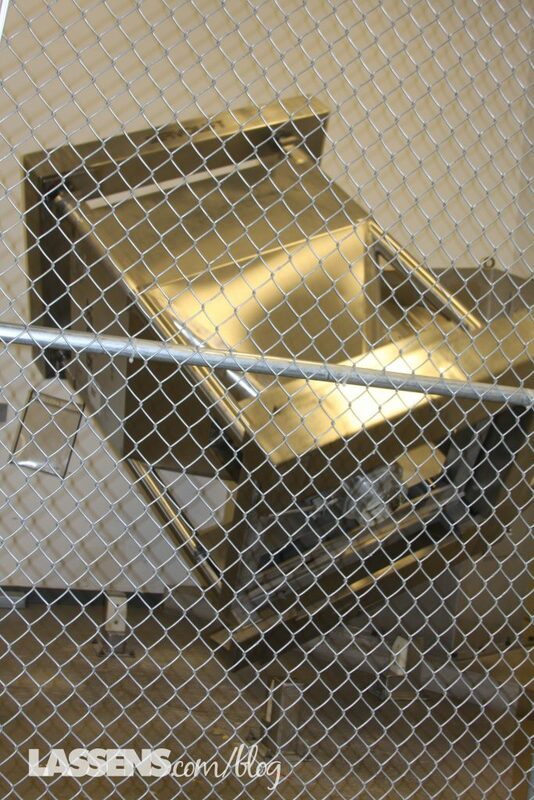 Those foods are crushed and pulverized, and tested to make sure they deliver the nutrients promised. Some batches require the addition of some vitamins and minerals to bring them to the label amounts. In an amazing set of machines, the pulp is then cool dried. It looks a bit like a smoothie! 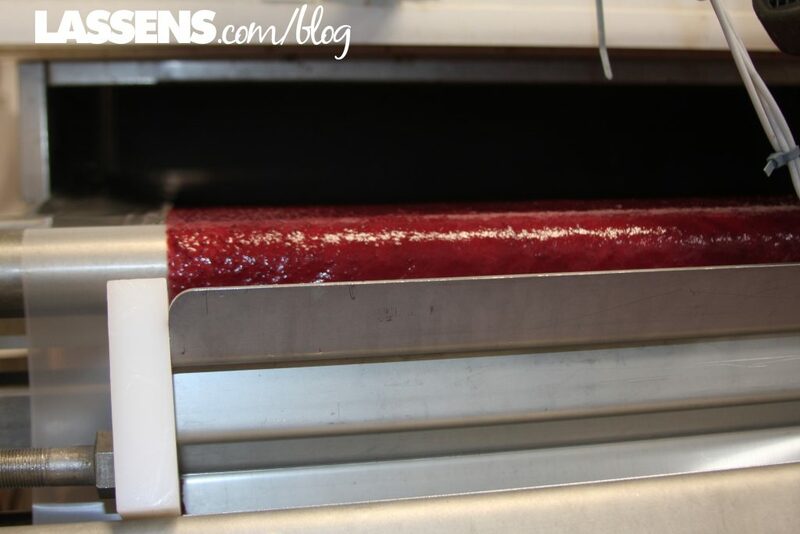 The pulp looks like a thick smoothie as it is spread onto the dryers. 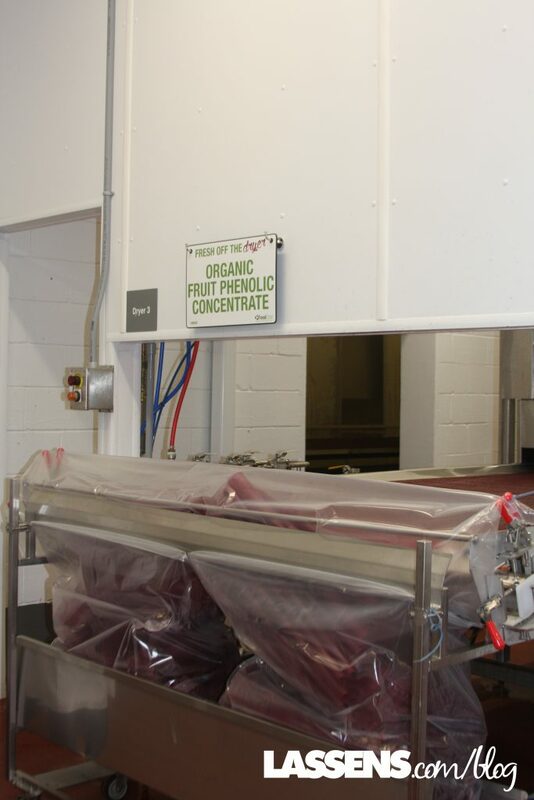 The temperature stays low and air is circulated around the pulp to dry it very thin. After it slowly went through the machine, we were able to sample the crispy product! Mega Food values consistency in their products, and they want to make sure every tablet contains what is on the label, so they blend the materials in a beast of a machine called the Bear Claw. We were lucky to see it at work when we were there! The Bear Claw tipped every which way to blend all of the product! Next comes tableting, coating (so that the tablets hold together and are protected from moisture and air), bottling, and then shipping. We also spent some time with Mega Food scientists/product developers, and were able to taste their upcoming products — Vitamin C Gummies and B-12 Gummies. It was fun to give them our opinions! Watch for these products within the next year. Coming Soon to a Lassen’s near you! 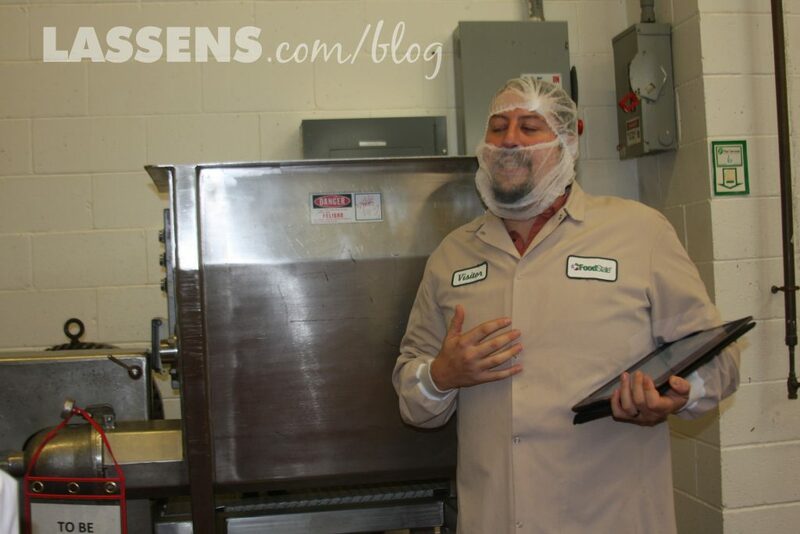 We had a fantastic time with some of our valued team members visiting Mega Food in New Hampshire. 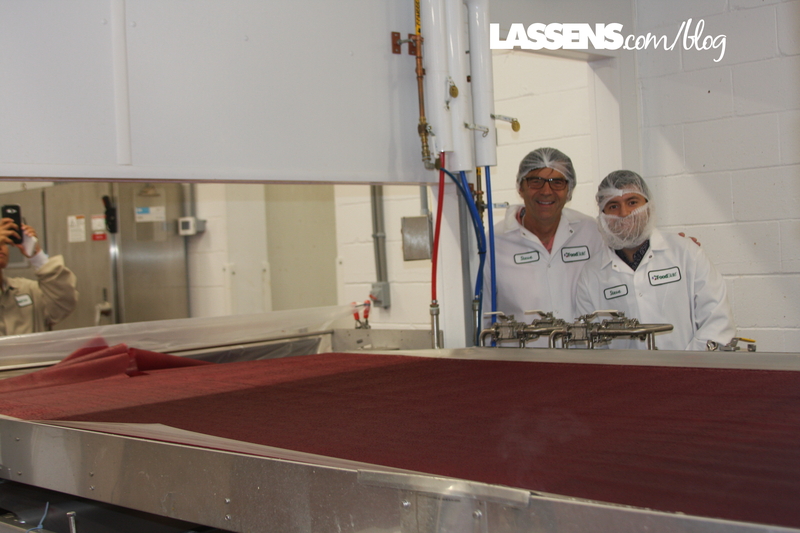 Since Lassen’s started in 1971, just two years before they did, we have been partners with this wonderful company almost from the beginning! Their high quality and commitment to integrity and transparency makes them leaders in the industry, and we are proud to carry their amazing products. Thanks, Mega Food, for your hospitality!